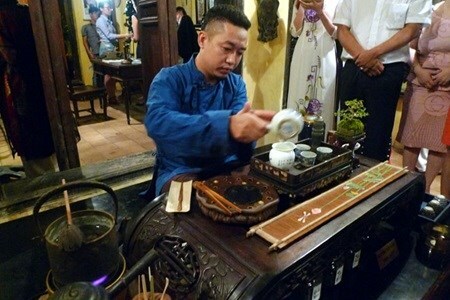 Hanoi (VNA) - An event dedicated to Vietnam's tea traditions was kicked off at the House of Heritage in Hanoi's Old Quarter on November 20. At the event's opening, tea master Cao Son, said: "Vietnam is among the world's top 10 tea producing countries. We have more than 40 different tea varieties as well as several festivals honouring Vietnamese tea culture. For centuries, tea has been the most popular beverage, reflecting the country's quintessential culture. Vietnamese people have elevated their custom of tea drinking to the tea culture." He also said tea has become the beverage of choice and a way of life as people often gather to drink tea and enjoy each others' company. "Tea is not only served during and after the meal, but also is served to welcome guests as a form of hospitality," Son added. Participating the event, visitors can enjoy a cup of hot tea while enjoying a Vietnamese space adorned by sophisticated bird cages, refined tea sets, elegant flower vases, and Hanoi A's decorative lacquer items, which all were made by traditional craft villages around the capital. Discussions on Vietnamese tea traditions will be held during the event. In addition, calligraphy demonstrations, ca tru (ceremonial singing) performances are also on the event's agenda. The free event, which runs until November 23, will celebrate the Day of Vietnam's Cultural Heritage, November 23. The House of Heritage is at 97 Ma May Street.